Welcome to the Sanderson family website. This site contains photos of the C. Devon and Judy T. Sanderson Family that were taken in 1998, 2002, 2010 and, most recently, May of 2016. 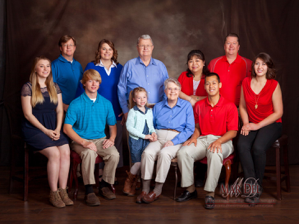 Judy & Devon Sanderson Family, May 2016. Todd, Cecile, Jonathan & Jennifer Sanderson. Hal, Carol, Abby, Jacob & Mary Clare Sanderson. Sanderson grandchildren with Grandmother & Grandfather.